Smartpen Reading Activities - Fluency tests, interactive books, and more! With so many creative smartpen reading activities and the nature of the technology, the smartpen is a perfect technology tool for teaching reading at any age level. I'll never forget the enlightenment we gained as parents from a parent-teacher conference with our son. His teacher had used the smartpen to record snippets of the students in her class reading aloud. 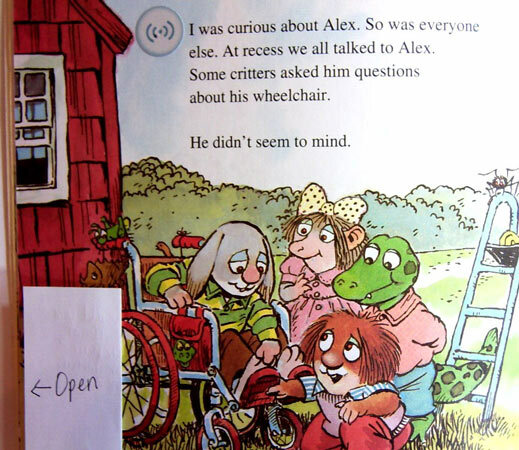 At home, our 5th-grade son (who had started reading chapter books before kindergarten) was a distracted out-loud reader. He hemmed and hawed and stumbled over words. However, the boy we heard reading on the smartpen sounded like a totally different kid! It appeared that he was a very well-spoken and fluent reader when his teacher was the audience. By incorporating the smartpen reading snippet into the parent-teacher conference, the teacher absolutely eased our minds about his aloud reading. It seemed he was just hamming it up at home (and for those that know him, this comes as no big surprise)! This did, however, drive a point home for me as a parent in regards to the smartpen. 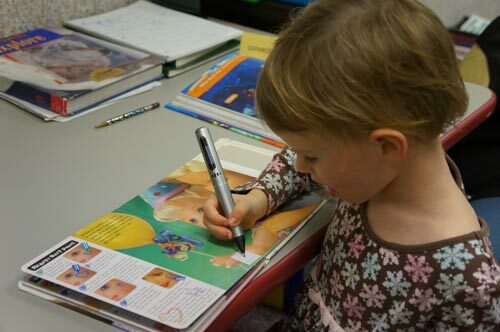 The smartpen makes sharing reading, whether for instruction, assessment, self-evaluation, or enjoyment, easy. In addition, there are hundreds of smartpen reading activities that just make reading instruction more effective, efficient, and fun! Add your voice or recorded sounds to small Livescribe dot paper shapes (rectangles, etc) and then taping/gluing them to your word wall document or other object. You can use either audio dots created by cutting apart the Livescribe dot paper or Sound Stickers. 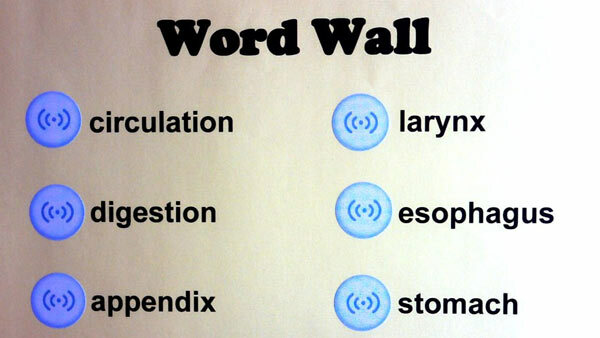 The Word Wall can even expand to include definitions, Latin root words, use the word in a sentence, etc. Take it even further by linking study tools to it - funny songs used to aid in memory or pneumonic devices that go along with the idea. Running records or reading fluency tests are a common assessment in reading instruction. The smartpen is an excellent tool for this as a timer is built right in to the pen, and the pen is capturing the audio as well as linking it to the teacher notes. The teacher simply prints the reading test on a piece of Livescribe dot paper, taps Record and starts the student reading, and taps Stop when the student completes the passage, making annotations directly on the paper as the student reads. The teacher can also add scoring annotations on playback to make sure they completely and accurately scored the test. With the linked audio and notes, the teacher then has the ability to share the results with the student, as well as parents at open house or in an electronic portfolio. The audio record can also be shared with other staff members that may be able to consult on activities that might help the student. Scoring may very well be more accurate when done from the audio recording that when done with one run-through, making this a more effective way of keeping running records. What a fun opportunity for a student to hear a running record from the beginning of the year compared to the end of the year! The research is firm; repeated reading with a good auditory model improves reading fluency. The teacher reads the passage to the students; they record with their pen and then practice. Students can hear the model and use the page controls to slow down the model as needed. As their fluency increases, they can increase the speed with the page controls. One of the most popular smartpen reading ideas, through a very simple process of recording the pages of a book onto dot-paper audio dots using the smartpen, any book in the classroom library can be made interactive. 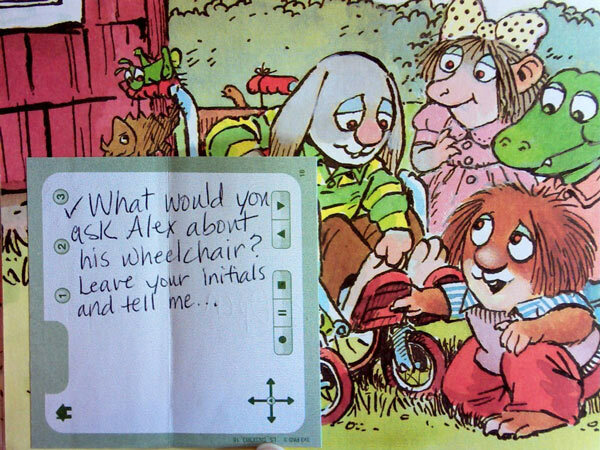 The words can be read to the student, and questions can even be posed to the student requiring a verbal response. In the video below, this teacher explains how she incorporated Livescribe smartpens and interactive books into Daily 5 reading centers. She essentially created two centers, one for higher level reading students to create the books and one for struggling readers to read through the books with the smartpen. The students record their activities at each center and the teacher can then listen to hear if each student fulfilled their role/obligation. This eliminates the need for a teacher to have their immediate presence at each activity to assure that the activities are done. Students are held accountable, helping them to stay on task and on time. The teacher can at any time check for understanding and adjust their instructional conversation with students in order to tap into higher levels of critical thinking. Use pencasts to create formative assessment opportunities for reading strategies. Students can record questions, inferences, or connections into the pen as they read, giving the teacher an idea of how they are progressing in developing those strategies while reading. Students can also record reading summaries and sequencing pencasts. 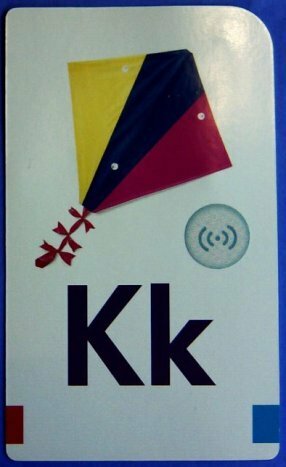 Create and adhere an audio dot to each sight word flashcard that contains the correct pronunciation for the word and any additional information, i.e. pronunciation hints, etc. 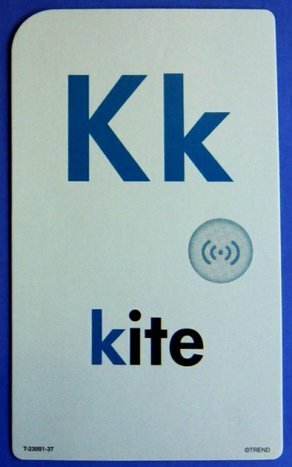 You can customize these flashcards with any audio that you desire - something funny to help students remember or catchy songs or phrases. Talking flashcards are also useful for subjects with complicated terminology such as science. We want your ideas for more smartpen reading activities!